The Moccasin construction is one of the oldest methods to make a shoe. It is historically the original footwear of the North American native population as well as hunters, traders and European settlers. The construction consists of upper, quarters and insole in one piece stitched together with a vamp apron on top. 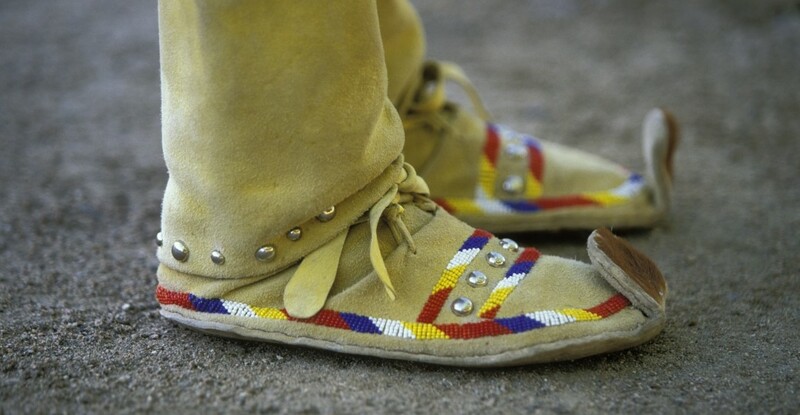 The moccasin was originally constructed without any hard sole to make the wearer feel the ground and make less noise. The moccasin construction is at it´s core a very soft and flexible construction but depending on the making can be more built up as well. Not all shoes featuring moccasin stitches are having a true moccasin construction with a separated vamp apron. The moccasin has a single layer section forming the insole and quarters. The last is put in the insole and a vamp “apron” stretched on top of the last. The stretched apron is stitched to the gathered edges of the quarters around the last creating the characteristic look. 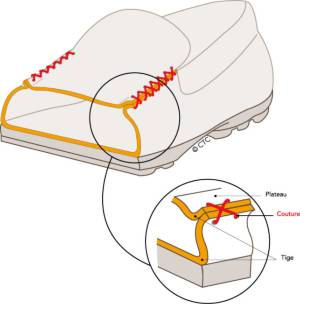 The outsole is then either attached by cement or by blake stitching. Although sturdy yet flexible the construction with a single vamp is not very water proof since the seam line offers a path for water to get in. There are silicone coated thread and other treatments to improve water resistance but eventually this will wear off. To deal with this situation either a double vamp or a triple vamp construction can be used. Different vamp constructions. Blake stitched to outsole. With the use of multiple vamp sections the stitchings are placed in different locations not to allow water seep through more than 1 layer. 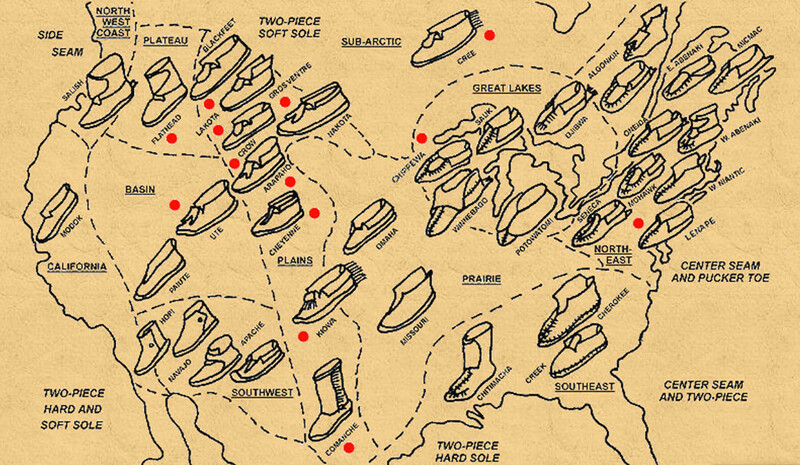 Map of America and moccasin typology spread. Image via Native Tech. As seen on the map each tribe has there are many different varieties of moccasins and some of the tribes could be directly identified by their moccasins. The Blackfoot and Chippewa nations got their names from the type of moccasins they were wearing. As climate is different the moccasins was also different. Some needed a more hard sole, to protect against rocks, or cold. Moccasins from the Apache tribe was for instance featuring a turned up front to protect seams from getting worn out. 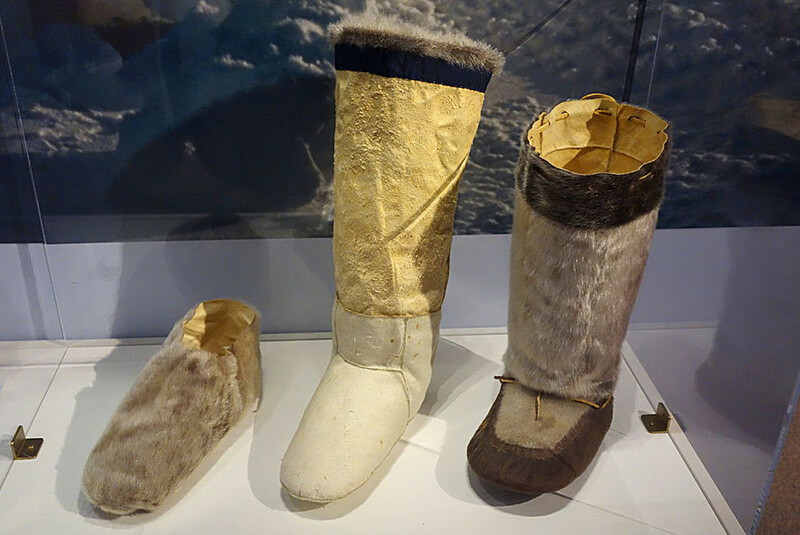 Other extremes, though not fully classifying as moccasin construction, is the Inuit Makluk. The cold climate needed a warming and insulating moccasin. A three piece Inuit Makluk. You start by the far left shoe to keep your foot warm. Then you put it into the middle boot and finish it of with the right boot to keep you covered against snow entering anywhere. Today moccasin construction is seen in either classical moccasins but also in traditional loafers. 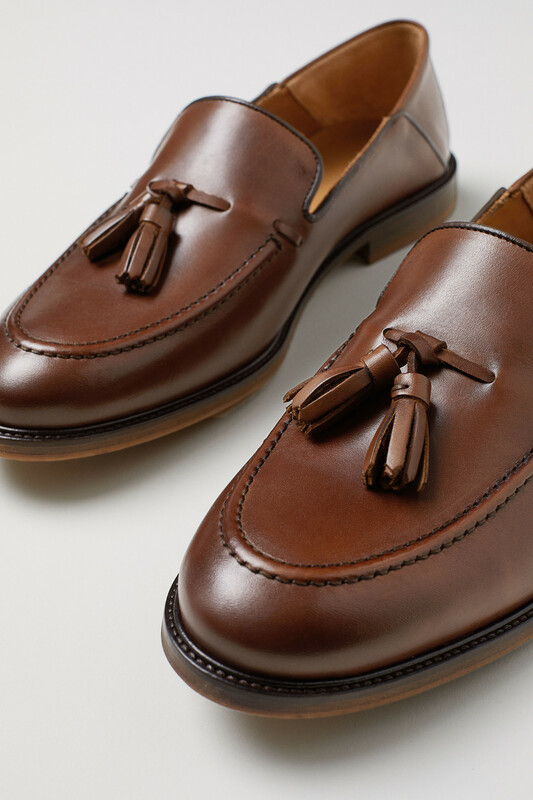 More about loafers in a separate article.